Twenty or more years since digital Media Asset Management systems came into being a MAM implementation for many operators remains a daunting prospect. An off-the-shelf, packaged solution approach reduces time to implementation, minimises financial risk and delivers tangiable operational benefit. The failure of high-profile initiatives means that, for many, MAM has become synonymous with large capital costs, a painful transition to operational service and, ultimately, unrealised benefits. Deferment of a MAM initiative is all too common and consequently media businesses suffer from inefficient workflows or miss out on new revenue streams. Equally, many operators consider that the operational issues they face, be it throughput bottlenecks or new business objectives, do not require a big MAM implementation. We agree, and have cooked up BLAM-in-a-Can, an entry level packaged media and workflow management solution. BLAM-in-a-can provides a quick and easy deployment to suit a range of operations – from content supply chain management to post production. 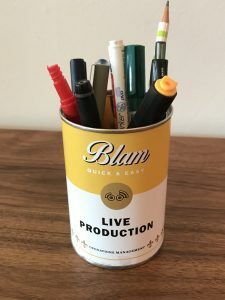 Each package includes a core BLAM complete with the relevant connectors and plug-ins (BLidgets) to support the pre-canned workflow. BLAM-in-a-Can supports existing processes but drives efficiency through automation and task management. BLAM-in-a-Can will suit many operations out of the can but can grow with your business needs. Additional BLidgets may be added to meet new requirements and long term value for many will come from the migration of services to the cloud. In addition to BLAM-in-Can we have a number of new workflow BLidgets on show this year. These are largely focused on accessing 3rd party provisioned services as part of a BLAM workflow and demonstrate the openness and flexibility of BLAM. BLidgets are the building blocks of the Blue Lucy Asset Manager’s workflow capability and enable operators to rapidly build process and task-driven workflows to deliver efficiency. BLidgets provide management control of Blue Lucy plug-ins such as transcode as well as data adaptors and processing connectors to a wide range of 3rd party systems and services. Using BLAM’s new workflow runner, operators can now download, install and even create their own BLidgets to create customised workflows. It is BLAM-in-a-Can, however, that has caused the most excitement in our marketing department which has created a range of branded cans inspired by the Andy Warhol’s 1962 Campbell’s Soup Can piece -fitting in with our broader pop art themed stand graphics. 300 cans have been produced – including all six ‘flavours’ – but instead of soup, each can is filled with chocolate money representing the value that BLAM can bring to your operation. The chocolate is delicious and will give you that extra energy to get around the ever expanding show. In addition, one lucky visitor will pick up a can containing an Amazon streaming media player – so do stop by 7.G07 and pick up a can of BLAM.